← Only 50 days til Christmas! Hi loyal followers of Oink (that what he calls you all). As a birthday present, Oink said I’m allowed to have my own blog post. So long as I mention how great he is. And don’t hog my mum’s new phone for too long. And also compose a song in his honour with at least five verses. You know, I’m not sure that this is worth it…. 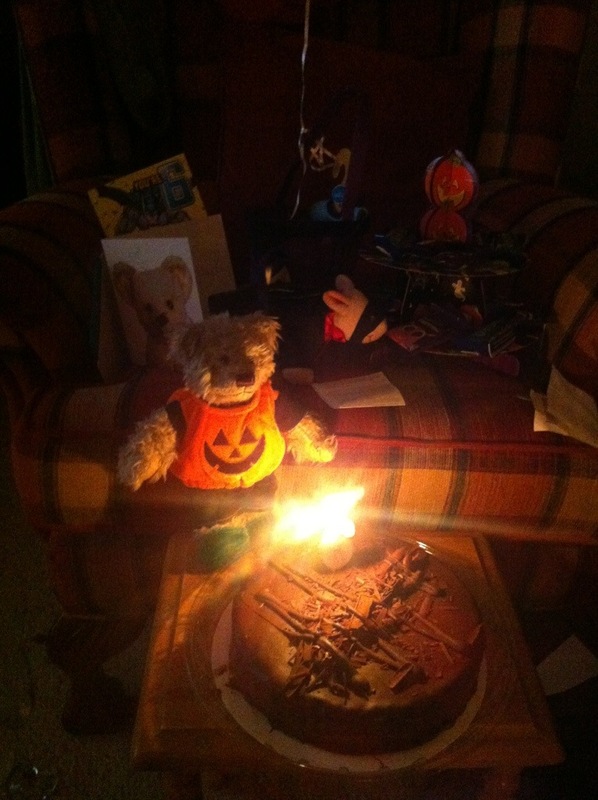 We had a lovely dinner, pumpkin soup (like my costume) then lasagne and then BIRTHDAY CAKE!!!! It was huge! And there were presents! I got a birthday balloon with ‘6’ on it and a candle with ‘6’ on it and a bucket full of presents. I got a new rugby shirt, a model airplane and a skittles game. I can’t wait until my next birthday. Christmas is great but I have to share that with Oink. Here’s a photo of me blowing out my candle. If you look closely you can see the string of my balloon. You can also see Oink sneaking about in the back trying to steal all my birthday chocolate when I wasn’t looking. Oh well. This entry was posted in Uncategorized and tagged Halloween, Ted's birthday. Bookmark the permalink.